1000ft spool of CAT6 cable at a price that can't be beat. 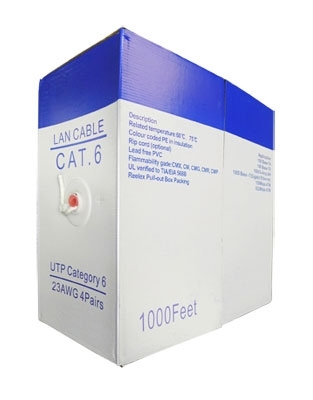 CAT6 network cable is the choice for professionals to reach speeds up to 1000 MBPS on the network. Network cable has several uses in CCTV applications. It can be used to run analog CCTV video signals using Video Baluns up to 1000ft, it can be used to run RS485 signals for PTZ cameras, and of course is used to wire IP network cameras. CAT6 cabling is superior to CAT5e because of its thicker gauge wire and hence the ability to run current and video/data signals longer distances.